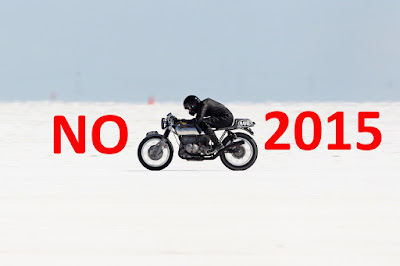 There will be no motorcycle land speed record breaking this year at the Bonneville Salt Flats in Utah, as the bodies that organize the AMA Land Speed Grand Championship/Bonneville Motorcycle Speed Trials 2015 announced that the event is canceled. This is the second major event to be canceled this year, after the Speed Week was also skipped for the same reason, namely, the poor condition of the salt. According to BMST's Event Manager and owner Delvene Manning, the conditions that led to the canceling of the first event were improving, but not at the rate needed for safe racing in the late August to early September races. Manning adds that the weather conditions seemed to allow water to evaporate at a normal rate, and it looked like things would be okay, the Mountain Course and Pit areas are currently covered by half and inch (12mm) of water. At the same time, the International section of the salt flats was not ideal on the entire distance and the layer of salt would be massively damaged from 300 bikes over five days. Even more, the damage the salt layer took during the last racing season has not "healed", Manning adds, and this means that the presence of more motorcycles in those areas is dangerous. He says the decision was very difficult to make, as everyone involved in organizing this event knows how many resources and efforts the racing teams invest in preparing for the Bonneville Motorcycle Speed Trials. No forecasts as to the condition of the Salt Flats next year have been made, as it looks like things change too quickly in the area, and such predictions are impossible. Is racing at the Salt Flats dying?